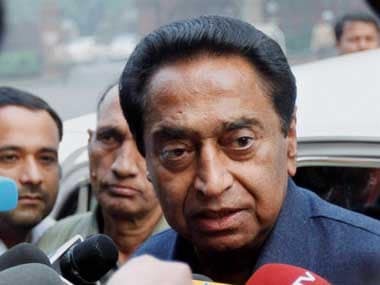 The Congress' search for a leader to match the political stature of Chief Minister Shivraj Singh Chouhan in poll-bound Madhya Pradesh has ended with the anointment of veteran Kamal Nath as the chief of the party's state unit. The nine-time parliamentarian, who will lead the party in the Assembly election scheduled for later this year, is expected to unite the faction-ridden Congress and provide it with a sense of direction in its fight against the incumbent BJP. He replaces a much younger Arun Yadav. Kamal Nath’s announcement as MPCC president has brought jubilation among a large section of Congress workers in the state, including the youth, as they feel that he is the right choice and will pose a tough challenge for the 15-year old BJP government. Will Kamal Nath prove to be a game changer? This longest serving member of the Parliament from Chhindwara constituency, is known as an efficient floor manager, an able administrator and a proponent of economic development, having a strong camaraderie with the industry. “Kamal Nath is master strategist, who knows how to prepare the party to contest elections. Having long experience as a parliamentarian, he’s an excellent floor coordinator. He knows the merits and demerits of every leader in Madhya Pradesh, which will benefit the party. He also has the ability to bring all the leaders together and end factionalism within the party,” Madhya Pradesh Congress spokesperson Ravi Saxena said. With Kamal Nath at the helm of affairs, the All India Congress Committee (AICC) has appointed Lok Sabha MP from Guna, Jyotiraditya Scindia as chairman, Campaign Committee and four working presidents. With this, the party has attempted to give representation to various communities and factions. While Bala Bachhan is a tribal leader and a Kamal Nath loyalist, MLA Ram Niwas Rawat is a Scindia loyalist. The other two — MLA Jitu Patwari, who belongs to a backward community and ex-MLA Surendra Chaudhry are known as Digvijay Singh loyalists. The choice of Kamal Nath also validates Rahul Gandhi’s statement during the Congress Plenary Session and Steering Committee meeting that old guards in the party would be given due respect and responsibility along with the young blood. Kamal Nath, 71, a Doon School alumnus is close to the Nehru-Gandhi family. He was close to former prime minister Rajiv Gandhi’s bother Sanjay Gandhi, who was his schoolmate. “Kamal Nathji is a father figure for the Congress family in Madhya Pradesh. His leadership will unite the party and end groupism existing within the state unit. Moreover, he’ll act as a role model for the youth, as he has helped a large number of unemployed youth in his constituency to get employment,” remarked Amit Soni, state co-coordinator, IT & Social Media Cell, MPCC. Former chief minister of Madhya Pradesh and AICC general secretary Digvijay Singh, who recently announced his comeback in state politics and is planning to take out a statewide Ekta Yatra to regain his base, apparently backed Kamal Nath for the top post. Digvijay often refers to Kamal Nath as his ‘elder brother’. It’ll be interesting to watch how Digvijay charts his new political innings in the new set-up. Once known as the political mentor of Congress president Rahul Gandhi, Digvijay apparently lost favour within the party due to his remarks that started causing embarrassment for the party. The last phase of Digvijay as chief minister had witnessed severe grievances and anger amongst the people of Madhya Pradesh on various issues — from poor governance to deteriorating infrastructure. The BJP came to power by showcasing the Digvijay Singh government’s failure on ‘bijli-sadak-paani’ — severe shortage of electricity, poor condition of roads and lack of water supply to farmers. It has remained in power ever since, for the last 15 years. “It’s good that Digvijay Singh hasn’t been made in-charge or given any post, as his active presence is likely to do more harm than good. We faced a lot of problems during elections and bypolls due to his caustic remarks on Hindutva or saffron terror, etc. Had he been appointed as MPCC chief, our chances of losing seats would have increased,” a Congress worker said on condition of anonymity. Is Kamal Nath’s appointment a setback for Scindia? 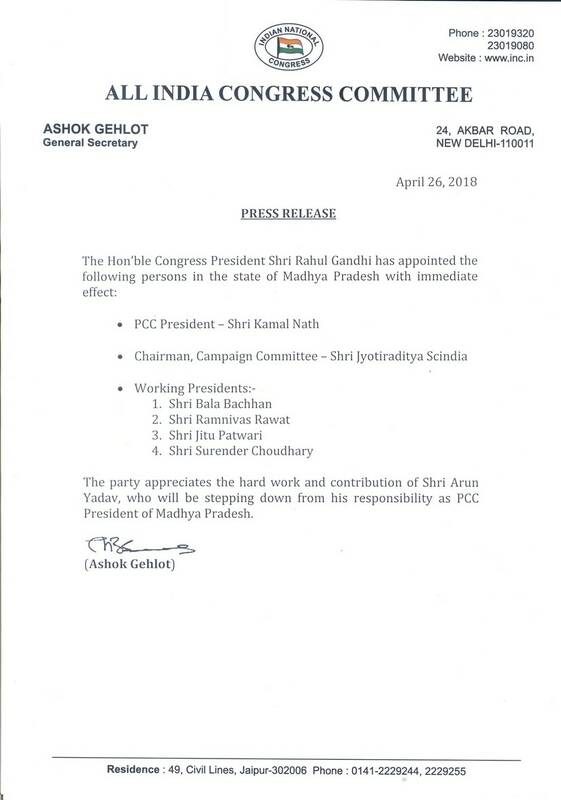 A section within the MPCC sees Kamal Nath’s appointment as a setback for young leader and Lok Sabha MP from Guna, Jyotiraditya Scindia, who has been made chairman of the state’s campaign committee. “It’s wrong to view Kamal Nath’s appointment as a setback for Scindia, as the former comes with rich experience, and would work as a strategist to lead the Congress against the BJP. On the other hand, Scindia, who is relatively younger, will lead Congress’ campaigning by being active on field. 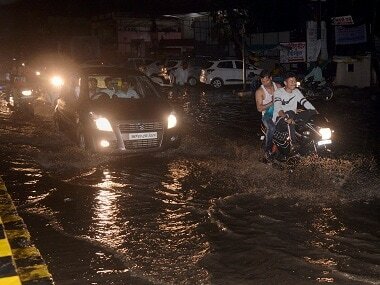 Right now, it’s a perfect team,” a Congress leader said. Who will be the Congress chief ministerial candidate? Congress hasn’t revealed its chief ministerial nominee for Madhya Pradesh. According to sources, the emphasis of the Congress high command is on gaining numbers in the upcoming election. “The Congress doesn’t want to bring up this issue right now. The top leadership wants us to get the maximum seats possible in the upcoming election. The party will then decide the candidate based on experience and capability. We have a host of experienced leaders, but the announcement of a chief ministerial candidate will be made at an appropriate time. 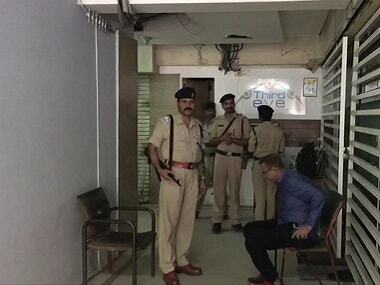 Let’s not speculate,” a senior Congress leader told Firstpost. Kamal Nath has considerable influence in the Mahakoshal region of MP. Other senior leaders too hold sway in certain regions, like Arun Yadav in Malwa, and leader of Opposition Ajay Singh in the Vindhyachal region comprising of Rewa, Satna, Sidhi and Singrauli districts.